Save time and money with the Brake Inspector® In-Cab Air Brake Diagnostic System. 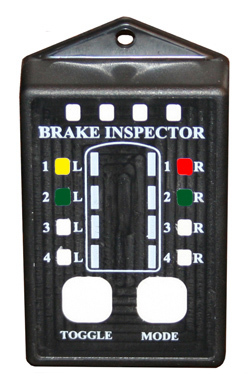 The Brake Inspector® electronic in-cab display provides real time indication in the cab of a truck or bus, of air brake activity such as brake stoke travel, brake fade, hung up brakes and non-activating brake chambers. The display shows the status of up to eight brake chambers per vehicle. Each time the air brakes are applied the gauge will simultaneously show the brake stroke status of each brake chamber utilizing a series of colored light emitting diodes (LEDs). Each chamber that is being monitored has a corresponding LED position on the gauge. GREEN indicates " air brakes are in adjustment"
YELLOW indicates "air brakes are approaching the out-of-adjustment phase and have only 1/8" of travel left until they are at the maximum allowable stroke limit"
RED indicates "air brakes are at or exceeding the maximum allowable stroke"
The last brake application, before the engine is turned off, is stored in memory enabling the driver or maintenance staff to recall the status of the air brakes at any time simply by pushing a single button. The driver or maintenance staff can individually check the status of each brake chamber by pushing the status indicator button and cycling through each chamber position starting from the front left chamber. The LED beside the brake chamber that is being inspected will light up along with one or more of the row of four LEDs on top of the gauge. These four LEDs two Green, one Yellow and one Red depict the complete brake stroke travel of a particular chamber. The internationally accepted colored-code standard, GREEN for "GO", YELLOW for "CAUTION" and RED for "STOP" has been used to represent air brake stroke travel. “If a vehicle or trailer is equipped with automatic adjusters and the pushrod stroke exceeds the legal brake adjustment limit, it is an indication that a mechanical problem exists with the adjuster, or within the foundation brake components, or the adjuster is improperly installed. The manual adjustment of an automatic adjuster within legal limits is a band aid approach and is not fixing the underlying problem that will soon result in the brake being out of adjustment. Furthermore, the routine practices of adjusting most automatic adjusters will most likely result in premature wear of the adjuster”. Brake Safe®, Arrow Logger™, Brake Inspector®, Hub Alert™ and Termin8R® are trademarks of Spectra Products Inc.